Watch videos of Kettukazcha and Ethirelppu ceremony of Orippurathu Amma. Watch videos of Aaluvilakku and Vazhipadu Thookkam. The Ezhamkulam Devi Temple is dedicated to Shakti and is located in Ezhamkulam, Adoor, Kerala, India. Ezhamkulam is a village in Pathanamthitta district in Kerala. The temple is famous for Garudan Thookkam and Kettukazhcha which take place as a part of the annual Kumbha Bharani festival. The scenic beauty, the bliss of solitude and mental peace imparted by this place will ever be in the mind of a devotee who had at least been once to this place. Ezhamkulam Devi temple is famous for Garudan Thookkam and Kettukazhcha which take place as a part of the annual Kumbha Bharani festival. Ezhamkulam Devi Temple history dates back to over 800 years. It is believed that this temple is another residing place of Goddess namely Kodungalloor Devi . Once a woman from Parakode Avaruvelil Kuzhivelil family went to Kodungaloor temple for pooja purpose, along with her husband, after seeing the shrine and poojas, the woman didnt see her husband. The upset woman cried to goddess for help. Suddenly a radiant old woman came to her and not only consoled her but also accompany the woman to her home as a help. After reaching the native place ezhamkulam,both of them begin to take rest at bunds of the paddy field near the road and then went to her family home named 'Padinjerekkara'. After entering the gate, the old woman vanished. The family people searched for her everywhere and didnt find her. 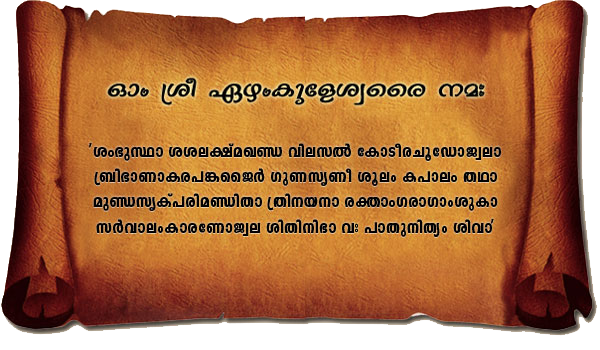 It is proven after Deva Prashnam that old woman was actually the Kodungalloor Devi itself. The avaruvelil family decided to establish an abode for Devi near the paddy field where they both taken rest . And the family lost no time in erecting a temple on this consecrated spot to house the Goddess.